East Midlands League winner Mark Pollard. I have fished so many winter league matches over the years that I have lost count. What I do remember though is the countless hours spent on fenland drains and our local rivers through the winter months at times struggling for a fish just to give the team a point or two. 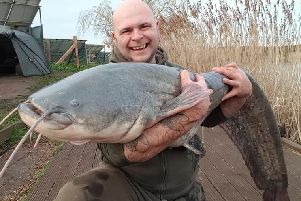 Those that fished Sunday’s round three of the East Midlands Winter League on the Old Nene at Benwick experienced the complete opposite. In fact, I would go so far as to say it was one of the best matches the league has produced since its formation over 50 years ago. Huge nets of roach, rudd and perch were taken and not just from the usual hot spots at the Benwick village end either. Just about every section was won with double-figure weights. However, the village end did produce the top weights with Mark Pollard taking the honours from peg A5. He put in yet another superb performance of small fish angling on the whip and waggler to finish with a fine 29lb 10oz. Runner-up from the same section was Kye Jerrom, who fished similar tactics to the winner but fell just short with 26lb 2oz. He was followed by John Taylor on 24lb 12oz. On the team front our local side Sensas Mark One could make no headway on the day and it looks as if they will have to settle for a minor placing this season, regroup and look to improve for the HAJAC Winter League in the new year. Browning Hotrods put in yet another very good team effort to take first place and now have a two-point lead over nearest rivals Stanjay Gold. Full Result: 1 M. Pollard, Stanjay Gold, 29lb 10oz; 2 K. Jerrom, Browning Hotrods, 26lb 2oz; 3 J. Taylor, Sensas Mark 1, 24lb 12oz; 4 S. Welford, Browning Hotrods, 22lb 3oz. Teams: 1 Browning Hotrods, 22pts; 2 Stanjay Gold, 31pts; 3 Matrix Image, 36pts; 4 Sensas Mark One Black, 37pts. League: 1 Browning Hotrods, 4pts; 2 Stanjay Gold, 6pts; 3 Matrix Image, 8pts. There is no winter league practice match this weekend but there is a March Open on the Old Nene through March. Give Bob Fitzjohn a call on 07970 673439 as soon as possible to ensure your place. It’s not just the Old Nene at Benwick that’s hit top form either. The Castaways club had a great result on Ramsey Forty Foot along the Narrows. First place on end peg 15 went to the in-form Mike Mohan with a fabulous weight of 21lb fishing the whip close in with pinkie over groundbait. He had a net of roach and also a brace of bonus perch. Runner-up on peg seven with a weight of 14lb 2oz was Alan Jopling and Mike Smith came in third with 14lb. A sharp overnight frost greeted the Ramsey AS lads fishing their midweek match on the Old Nene at Ramsey St Mary’s and my goodness did they find the venue in top form. Out in front with a truly spectacular 36lb of roach was Ken Taylor. He drew peg four and caught quality fish on hempseed. Malc Sansom fished hemp and maggot for 23lb 8oz, then came Harry Young with 16lb 14oz, followed by Malc Hobbs with 16lb 6oz. They were back for more on Sunday when Mark Williams won by putting 16lb 5oz to the scales taken on the whip with casters and hempseed. Second with 14lb 13oz was Simon Wagstaff then came Malc Sansom on 13lb 5oz. Ramsey’s Angling Trust Pike Qualifier at Exhibition Bridge was won by Paul Keepin with three fish weighing 17lb 2oz. Runner up with two pike for 9lb 1oz was John Watson, followed by Keith Rayment on 7lb 6oz.